Over the past years, there has been increase in packaged water consumption in Nigeria. Although, there are several studies on microbial safety of sachet packaged drinking water, there is no information on prevailing pathogens. 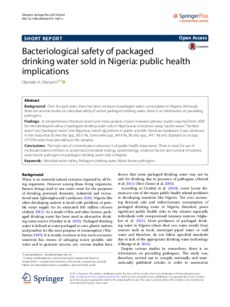 A comprehensive literature search and meta-analysis of peer reviewed primary studies reported from 2005 for microbiological safety of packaged drinking water sold in Nigeria was conducted using "sachet water", "bottled water" and "packaged water" and Nigeria as search algorithms in public scientific literature databases. It was observed in this study that Escherichia spp., (65.5�%), Salmonella spp., (44.8�%), Bacillus spp., (44.1�%) and Staphylococcus spp. (37.9�%) were more prevailing in the samples. The high rate of contamination observed is of public health importance. There is need for use of molecular based methods to understand microbial ecology, epidemiology, virulence factors and survival of isolated water borne pathogens in packaged drinking water sold in Nigeria.